A wine deep in character, full and round, Samsara was made of Syrah grapes and lightly filtered after ageing slowly in barrels for 12 to 16 months. An eternal cycle of life – Samsara means ‘to flow on’ and pass through the states of life and death. This evolutionary journey through eternal birth and rebirth is how life develops consciousness and fulfilment. 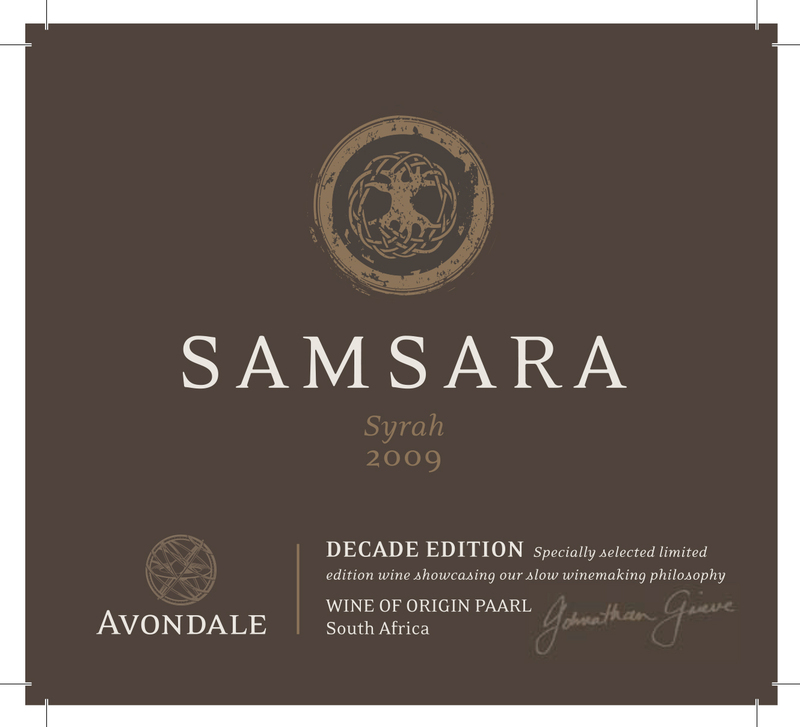 A wine deep in character, we named our incarnate Syrah, Samsara, as it represents the perpetual renewal and revitalisation of Avondale’s living system. Samsara’s Emblem – The well-known Celtic Tree of Life motif with branches and roots interwoven is symbolic of the continuous cycle of life. In its interconnectedness there is the strength and resilience that develops through experience and renewal. Grape Variety – Samsara is made from 100% Shiraz grapes of organically-grown vines that range from 10 to 17 years of age. They provide low yields of 4 to 8 tons of healthy, balanced fruit. The Making of Samsara– The grapes were harvested in the early mornings between 23˚ and 24 º Balling. 10 to 15% were whole bunch fermented which adds unique body and length to the wine. The balance was gently de-stemmed and went into tanks for 2 to 3 days before natural fermentation begun. Following the natural fermentation cycle, we allowed warmer ferments peaking between 30 and 32 º Celsius and lasted from 7 to 10 days. Our healthy grapes enabled a long post-fermentation maceration that took place over 25 to 30 days. Thereafter the wines was taken to 1st, 2nd and 3rd fill 225-litre French Oak barrels where malolactic fermentation took place. The wine was aged in barrels for 12 to 16 months and lightly filtered before bottling. Samsara’s Character – Soft wood and white pepper, violets, vibrant red berries and orange peel arrest the nose. Samsara is full yet well-integrated with hints of plum and cherry, cloves, cinnamon and pepper. This wine is spectacular well-balanced and carries an exceptional fruit-driven palate. The whole bunch fermentation results in firm tannins and good acid which gives the wine an unbelievable length.